2 in 1 weapon set?! SOLD! Very Cool Kit!!! Bought this right away and loving it. Yes 2 expansion kits in one. This made my 00 Sky a monster AND works with a large number of other HG kits too. A must have for BD fans. Very worth the money. BTW it looks sick on a RX-78-2 too. 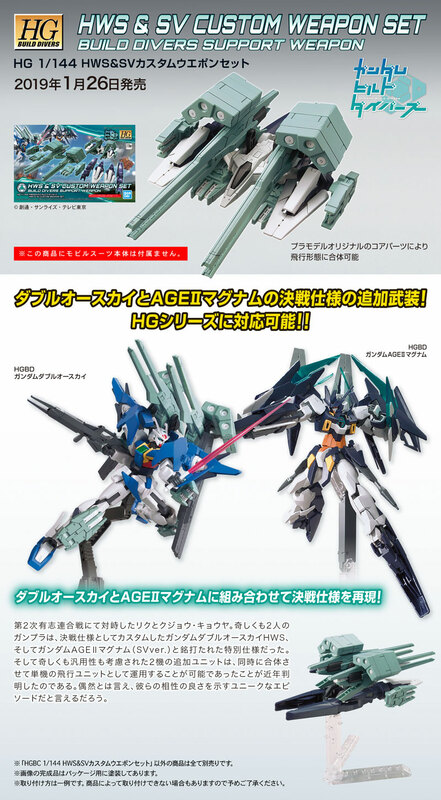 Weapons packs featuring Gundam 00 Sky's HWS (Heavy Weapons System) pack and the SV Custom parts for the Gundam Age II Magnum! Use it to upgrade your existing HG Gundam 00 Sky and Gundam Age II Magnum to recreate their final form weapon loadouts! Parts are also compatible with other HG kits for making your own unique custom designs! Runner x 11, stickers, Instruction Manual. Hobby Items November 2018 ~ January 2019 New Announcement Check out BANDAI Hobby's Nov 2018 ~ Jan 2019 release schedule! HGBD Gundam 00 Sky HWS, HGUC Narrative Gundam A-Packs, SDGCS Mazinger series, Figure-rise Mechanics Haro, HGBD Gundam Age II Magnum (SV Ver.) and more!